Do you reckon you're a true audiophile? Do you know the lyrics of each song from your neverending music collection? Do people often think you're from the music industry? I believe it matters not what genre is hip, which band is #1 these days. Preferences may change but what remains is your everlasting passion for music. It sometimes happens that we're craving new tunes so much that we don't consider playing music in any audio playing but iTunes (just because it's default). However, I'm pretty sure that you know your favorite tracks can sound much better if you just put some efforts into it. Usually, it doesn't narrow down to the sound card, speakers or headphones, but what really can make music sound deeper and clearer is a Hi-Res format of the song and a decent audio player that is capable of playing this format. Unfortunately, most audio players for Mac are designed to play more but not better. But how can we appreciate a song if the quality leaves much to be desired. All audio formats fall into two categories: compressed and uncompressed. The former in its turn can be lossy and lossless. We can't say for sure that some are good and others are bad. They're just different. Uncompressed music sound exactly how it was recorded in a studio. Sound waves are captured and converted to a digital format with no further processing. Because of that, uncompressed files are usually the most accurate, but they take up a lot of disc space (35 MB per minute of a song on average). The term "lossy" stands for a form of compression when some data is lost during the compression process. In other words, some sounds are thrown away for file size. Providing you use poor headphones you won't be able to hear the difference. On the other hand is lossless compression, that is a method of processing that reduces files size with no data loss in quality, so the sound of the original file remains. The main drawback is that this kind of compression makes the file size smaller, but still relatively big (songs are 50-100 MB on average). Uncompressed and lossless files are sometimes called Hi-Res (High-Resolution), and they sound best. Most ordinary audio players don't support Hi-Res formats, as they're not that popular as lossy (MP3, to be precise). My primary goal is to persuade you that the quality does matter and tell you about a useful and universal player, that is likely to suit music lovers. Some think that taking an uncompressed (or lossless file) and converting it to MP3 will just change the format, but indeed converting WAV to MP3 is a hideous thing to do. I'm certain you've been looking forward to a dream audio player. Today it's all about a brand new Hi-Res audio player for Mac and iPhone. Welcome VOX Music Player for Mac & iPhone. This simple yet powerful enough to support Hi-Res audio player was developed to change the perception of music in the world. It's truly one of the best players for Apple products. N.B. : VOX for iPad is currently being developed, as well as VOX for Windows and Android. Why is it VOX is that unique? The accent of the player is playback. Its powerful sound engine provides the sound of outstanding quality. It's possible since VOX supports both uncompressed and compressed files. It also features BS2B processing to make your music experience even better. Unlike iTunes and the rest of audio player for Mac, VOX interface was simplified to a small window with your music, that's it. It doesn't waste screen space, and the sections include your playlists, collection, queue, Radio, and SoundCloud stream. Radio includes 30,000+ radio stations from all over the world, SoundCloud stream allows you to stream songs, add them to your playlists, and if you also have a Spotify account, you can mix all those sources to create a perfect music collection. Now you don't need to switch between apps because VOX plays all of it. The equalizer has many presets for various genres, but you can always create your own set according to your sound preferences. All this makes VOX the best Hi-Res audio player for Mac and iPhone. As I've previously mentioned, Hi-Res files take up too much space. To solve this issue, VOX developers made a music cloud to store all your music library. VOX Cloud (formerly LOOP Unlimited Music Cloud Storage) is an unlimited music cloud storage that keeps your music so that you can access it anytime, anywhere. You no longer need to clean your Mac, use external HDDs or NAS devices to have some free space for music – VOX Cloud can store everything. It has no restriction regarding file size, format or bit rate. VOX uses cellular data to stream from VOX Cloud, but no song undergoes conversion or compression. You listen to what you've uploaded. SoundCloud, for instance, converts everything to MP3 128 kbps. VOX Cloud syncs your Mac and iPhone so whatever you have in Cloud is available on both devices. Say, you have a Hi-Res album on your Mac, but you also want to listen to it on iPhone. You upload the album to VOX Cloud, and then it automatically appears in VOX for iPhone with the same original quality. 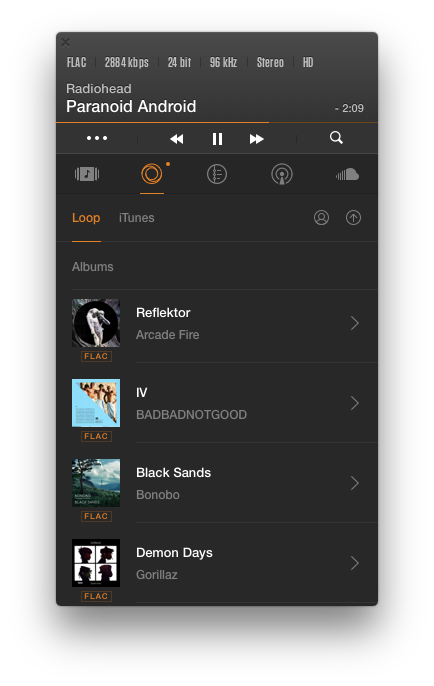 Besides, you can also download some songs or albums for offline playback. Very useful during flights and situations when there's no Internet. VOX Cloud is available for VOX Music Player users exclusively. It's an ideal audio player for Hi-Res music designed for anybody who cherishes quality and functionality. Let’s summarize. Why Hi-Res Audio Player? We are now on the edge of music revolution when quality is finally going to surpass quantity. Compressed and uncompressed music formats are all around us, and we need an audio player that can play all of them. VOX is a Hi-Res audio player that includes all the best elements to take our music experience to a whole new level. It can play most audio formats, presents the highest quality of the sound, scrobbles to Last.fm, and VOX Cloud stores every song we have. These tools make a perfect solution for music admirers who prefer Hi-Res audio.